RecipeSavants.com What could be more tempting than a succulent Filet Mignon? How about one that is wrapped in savory bacon! 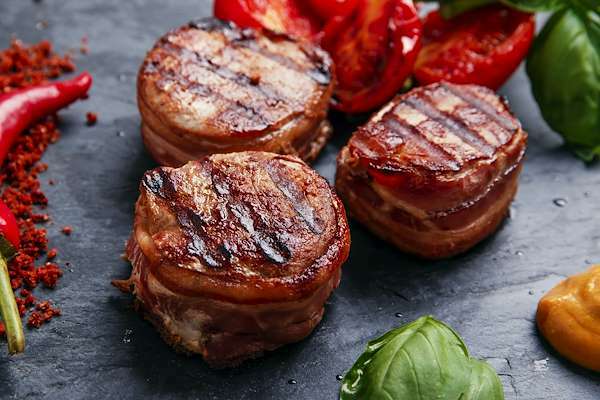 This recipe elevates the classic beef dish with the smoky sweetness of bacon. Sear the filets in a little butter & oil, wrap them in bacon, and bake them for 10 minutes. It is simple, quick, and makes an elegant dish. Smart Recipes, European Recipes, Beef,Pork Recipes, Recipes Beef,Pork European Bacon Wrapped Petite Fillet Mignon PT25M Serves 4 Ingredients: 4 Fillet Mignon Steaks 3 Tablespoons Salt & Freshly Ground Black Pepper 8 Slices Thin Bacon 0.25 Cup Extra-Virgin Olive Oil 0.25 Cup Butter Preheat the oven to 450 degrees. Season each steak generously with salt & pepper on each side. Wrap with a strip of bacon secured with a toothpick. In a large cast-iron skillet over medium-high heat, add butter and oil and heat until sizzling. Add the steaks and sear until golden brown, 1-2 minute on each side. Transfer the skillet to the oven and bake for 8-10 minutes, for a perfect medium rare. Remove from the oven and rest for 5 minutes. If you enjoyed this easy filet mignon recipe, you'll love these fresh ideas. 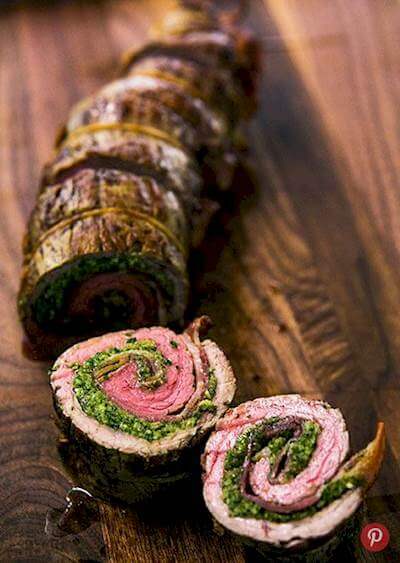 This sophisticated roulade starts with quick beef steak that’s rolled around nutty pesto and bacon. This make-ahead meal is perfect for entertaining. 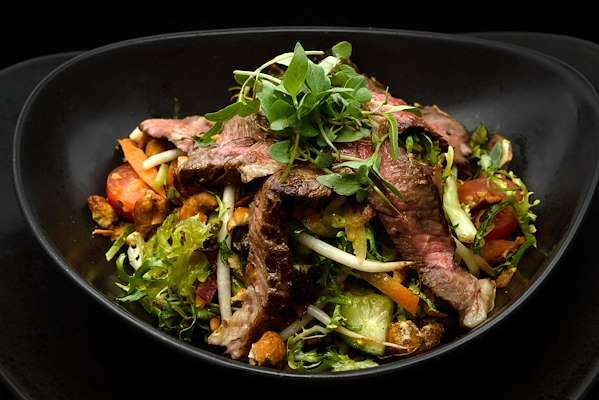 This juicy flank steak is grilled with a spicy honey-molasses mixture and then tossed with Parmigiano-Reggiano, romaine, lettuce and Dijon-Worcestershire vinaigrette. Its excellent for fancy dinner ideas; serve with a Belgian IPA. 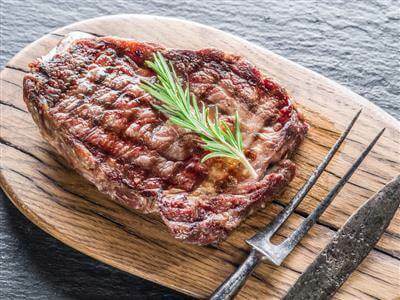 Here’s a ribeye steak recipe that packs a punch. The aromatic combination of roasted garlic, butter, shallot, rosemary and sage works well on other rich meats too such as venison. Serve with the caramelized onions. If you purchased some fresh spring asparagus from your local farmer’s market, consider turning some into a salad. Blanching the asparagus makes it tender-crisp, and retains the vibrant green color. Chop up some boiled eggs and crisp bacon, and you have a lovely spring salad that could be a side dish or a light lunch. Drizzle it with homemade honey-balsamic dressing.